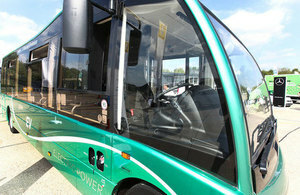 The Department for Transport and Office for Low Emission Vehicles have announced £48million of funding to cut bus emissions. The new funding will purchase 263 low emission buses as well as develop infrastructure to improve air quality in towns and cities. The government has announced a new partnership with Greener Journeys to tackle loneliness through bus design and initiatives to encourage bus passengers to talk to each other. Nineteen bidders across England and Wales will receive a share of the funding including Greater Manchester Combined Authority and Transport for London.